"I will be your Spiderman", a short film by a five-year-old child from Peshawar promoting education of street children, won first prize in the “Peace in the Streets Global Film Festival (PSGFF) at United Nations Headquarters. PESHAWAR -- A short film made by a five-year-old boy from Peshawar won first prize at the Peace in the Streets Global Film Festival last week. The festival, produced in association with the Peacemaker Corps Association (PCA) non-governmental organisation, seeks to promote peace and tolerance among the youth of the world. The competition awards prizes to young filmmakers in three categories: age 8 and under, ages 9-13 and ages 14-18. Esa Zaheer received first prize in his age category for his film "I will be your Spiderman" November 9 at UN Headquarters in New York. The film promotes education for all children. In the same age category, a girl from the Democratic Republic of the Congo (DRC), Sonia Kubika, won second prize, while a Japanese girl, Raika Akamane, won third prize. Two other Japanese children shared fourth prize. Winners in the other age groups came from various countries. "The film is about the right of education of every child to go to school," Esa, a kindergartner at the Scholars Academy School in Peshawar, told Pakistan Forward. The film, 2 minutes and 36 seconds long, begins with a pupil, portrayed by Esa, preparing for school with his mother. She gives him pocket money, urging him not to buy junk food. "My dad said money has power, so I save my small power everyday," he says in the film, saving the money in his drawer. The boy sees how a young girl, Sana, works in his house. She helps his mother prepare him for school, as well as performing other jobs. Seeing her sweep the floor, Esa thinks of a way to help Sana. "If Spiderman can save the world, I can change her world," he says. "Sana, I will be your Spiderman!" In a Spiderman costume, the boy runs to a store and buys some books with all the money he has saved. The next morning his mother is surprised to see Sana wearing a school uniform and carrying a bag, ready to go to school along with Esa. "If you want to see peace in the streets tomorrow, you have to educate your children today," he says. "Say 'no' to child labour. Educate every child!" Esa's father, Mukhtar Zaheer, a freelance 3D graphics designer, said he is proud of his young son, adding that Esa has made the entire country proud after his film won the global award. "All the credit goes to Esa as he not only prepared the film but acted in it too," said Zaheer, who helped and encouraged his son to make the film and present it in the competition. "I must mention here that since Esa cannot read, he memorised the dialogue, and we made the movie in one day, along with all the edits and acting," he told Pakistan Forward. "I want to tell the world that Peshawar is not all about militancy and terrorism; it is about peace and the world should know it," Zaheer said. Esa's film has promoted a softer image of the city and the country, he added. Zaheer said he made short films as a university student about ten years ago and now the love for the medium has transferred to his eldest son. Esa has two younger brothers, Wisam and Mikael. Their mother is a housewife. "Esa and Zaheer both have done an outstanding job by producing a film that promotes the education of neglected children," a local friend of the family, Farid Ahmad, told Pakistan Forward. Esa has made his entire country proud and the government must encourage him, he added. 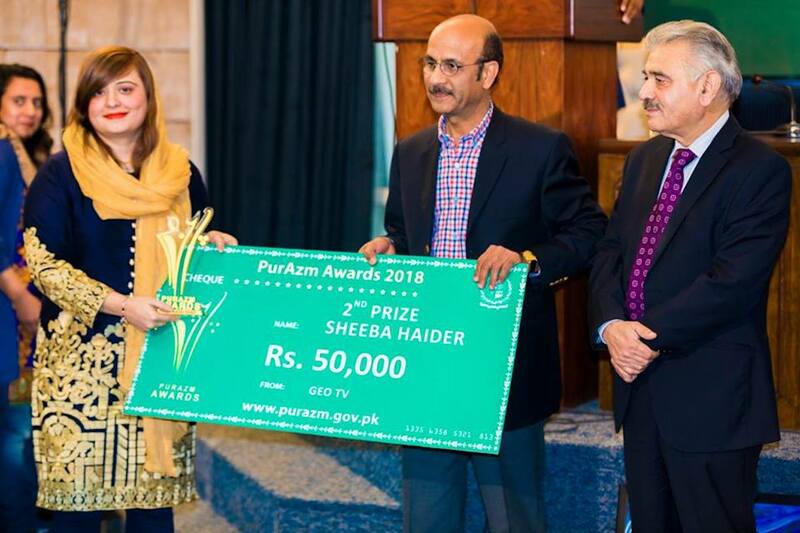 "This young talented child has done a great job by not only winning the award but by telling the world that more should be done for the children who are not going to school," Aftab Ahmad, a journalist from Peshawar, told Pakistan Forward. Many social media users praised Esa and his father for their achievement. "We are proud of Esa and Mukhtar Zaheer for the wonderful effort for the neglected children of the society," Sania Zahid, a resident of Peshawar, said on Facebook. The themes of the PurAzm multi-media competition included Peace over Violence, Inter-Faith Harmony, Resilience against Extremism and Stop Supporting Terrorism.